In his lifetime, Dr V set up eye camps in rural communities, a rehabilitation centre for the blind, and a training programme for ophthalmic assistants, personally performing over 100,000 successful eye surgeries. He was conferred Padma Shri in 1973. 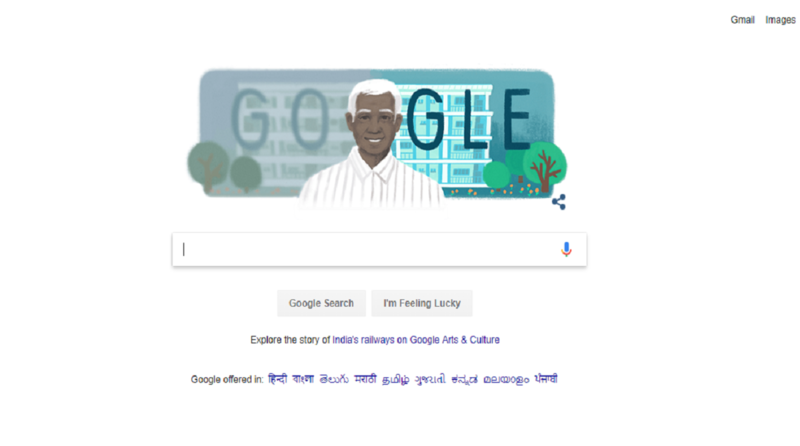 Google is paying tribute to renowned ophthalmologist Dr Govinda Venkataswamy on his 100 birth anniversary with a doodle. Affectionately known as Dr V, Dr Venkataswamy is most known for being the founder of Aravind Eye Hospital. Dr Venkataswamy was born on October 1, 1918, in a farming family in Vadamalapuram in Tamil Nadu as the eldest of five children. Fighting off his humble background, he went on to do a BA in chemistry from American College in Madurai and earned an MD from Stanley Medical College in Madras in 1944. Venkataswamy joined the Indian Army Medical Corps soon after planning a career in obstetrics. However, a severe rheumatoid arthritis struck him confining him to bed for a year and derailing his career plans. Dr V somehow managed to return to school in 1951 and studied for a degree in ophthalmology. He learnt how to perform surgery to remove cataracts—the leading cause of blindness. It is said Dr V could perform 100 surgeries in a day. He served as the Head of Department of Ophthalmology at the Government Madurai Medical College and eye surgeon at the Government Erskine Hospital in Madurai for 20 years. After his retirement, Dr V founded the Aravind Eye Hospital in Madurai, along with his four siblings. Aravind Hospital was started in a rented house in Madurai with 11 beds. The hospital has now become the largest provider of eye care in the world with more than 2,00,000 operations in a year. About 70 per cent of the candidates pay nothing or very little and this has given millions of poor the gift of sight. The treatments are financed by the rest 30 per cent patients who can afford the treatment but seek the quality of Aravind Hospitals.